Because it sits at 7,240 ft. Walker Ranch stays colder and holds snow better than the city of Boulder (located at a mere 5,460 feet). A snowshoe tour of this 7.8 mile loop has a wealth of scenery including meadow and mountain views, deep pine forests, the rolling waters of South Boulder Creek and extensive wildlife viewing opportunities. The rumbling of distant trains along the Rio Grande railroad adds to the ambiance of a wintery day. Oh and you’ll get a great workout -- there’s over 1,600 vertical feet to climb in the loop! From the parking area, the loop can be hiked in either direction. Left (clockwise) brings you immediately to the highpoint of the trail before descending a series of switchbacks into the deep forest. Don’t be surprised if you see mountain lion tracks in the snow -- they are local residents at Walker Ranch. The singletrack trail emerges after about 1.5 miles at an intersection with a road. Stay right (downhill) and follow the road to a sturdy bridge that crosses over South Boulder Creek. The lowest elevation of the hike may be the most beautiful as the trail crosses over a series of gritty boulders and the creek flows peacefully beside. From this spot, a steep series of waterbar-stairs quickly ascends to the second half of the Walker Loop. From the top of the stairs, the trail is more gradual as it passes through more forests and eventually popping out at a spacious meadow that passes by the lesser-used Crescent Meadows southern parking area. Staying on the loop past the parking lot ascends a small hill before beginning a second long descent to the creek. This is a popular picnic area and the area is well-known among fishermen. The flat, broad trail here is only a mile from the parking lot but there’s a catch: a stiff 700 vertical foot climb along an easy-to-follow, wide dirt trail that reaches the trailhead in less than a mile. If you’re short on time but still want a great workout, doing this aspect from the start (right, or counter clockwise) is rewarding! 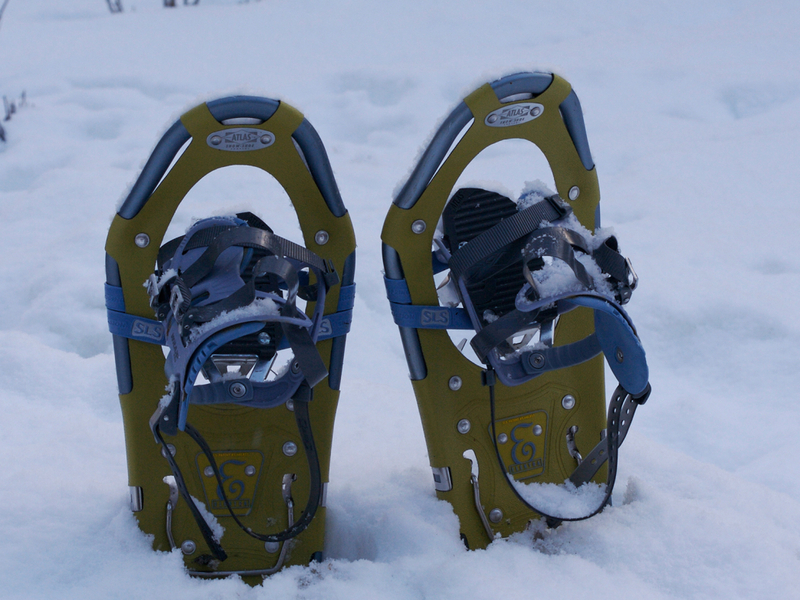 The full loop takes about 3 hours snowshoeing. Perhaps the trickiest part of this hike is the steep drive up to the trailhead -- it is reached via Flagstaff Road, a paved but steep mountain road! On snowy days, a 4x4 or AWD is a very good idea. When the snow falls, Walker Ranch is an immaculately peaceful place. The full loop is quite a workout -- but even a trek down to the river and back up is an excellent outing. Choose your own pace and bring a camera. In winter, Walker Ranch can be tough for more casual hikers due to the quick elevation drop (and climb). From the intersection of Baseline Road and Highway 93, turn west on West Baseline Road towards Chautauqua Park. Just after passing the park around 1.3 miles, the road begins climbing steeply; at this point Baseline becomes Flagstaff Road. At around mile 4.4, the top of road is reached. Stay on the road until mile 8.5. Leave the paved road and a sharp right bend and go straight onto a dirt access road that has a large sign for Walker Ranch in front of it. The parking lot is a few hundred feet uphill from this intersection. If the snow is deep, parking down at the bottom of the road is fine.